Thank you. It will be an honor and privilege serving you, the residents of Maricopa, when I take the oath of office in December. I would like to thank you for your support not only during the campaign, but in the voting booth. Every vote counts and every vote is special. I pledge to be the best council representative I can be – for you and for all of Maricopa. My family, friends and supporters know that I am a man of my word, and I am as committed to serving this city as I am in caring for our home. This is where we live, and this is where we are. I am forever grateful for the unwavering encouragement and strength I have received from my wife, family and close friends. Without you, I could never have done it. You, especially, Joann, you are my rock. 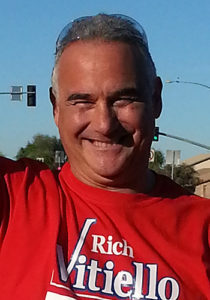 Rich Vitiello was elected outright to the Maricopa City Council in Tuesday’s Primary Election and was the top vote-getter.